Remote control is for use with all Johnson® and Evinrude® models thru 40 HP (except 1982 and later 20, 25, 35, 40 HP remote electric start models). This control is not recommended for use on outboards without "start-in-gear-prevention" feature. 1. Remote control assembly (1) may be mounted on port or starboard side. Allow minimum clearance of 4 in. between control handle knob and steering wheel, seats, etc., in all control handle positions. Mounting surface must be of sufficient strength to provide rigid installation. Additional build-up of the intended mounting area may be necessary in some boats. Snap-In® Remote Control Cables are available in lengths of 5 to 20 ft. in 1 ft. increments, and from 20 to 50 ft. in 2 ft. increments. Two cables are required for single outboard installations. Four cables are required for dual outboards. 1. Measure distance from center point (A) of remote control to each outboard centerline (B) and add 40 in. Use that length control cable or next longer cable length. All cable loops (C) must be 12 in. minimum diameter and all cable bends (D) must be 6 in. minimum radius. Example 1: A-B measures 12 ft. 10 in. 12' 10 ft. + 40 in. = 16 ft. 2 in. Example 2: A-B measures 18 ft. 10 in. 18 ft. 10 in. + 40 in. = 22 ft. 2 in. For dual installation, measure distance to nearest outboard to control and add 2 ft. (E) to estimate length of cables for outboard furthest from control. Refer to Service Manual when working on remote control box. 1. Remove two screws in back of box holding gear shift and throttle lever halves together. 2. 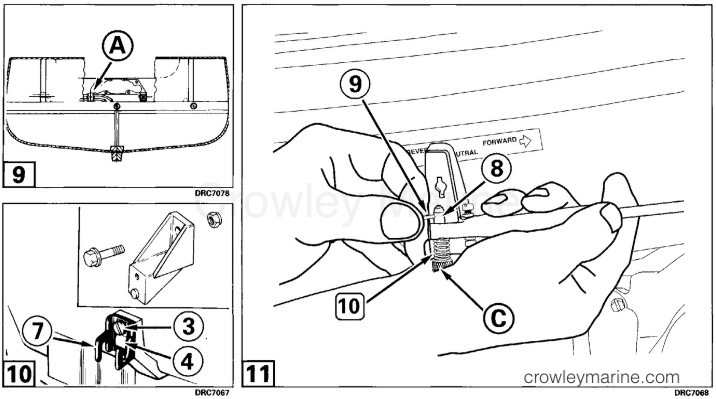 Remove center screw (A) and remove throttle control lever (B) and nylon casing guide (C). 3. Insert control cable (D) through nylon casing guide (C) until hole in cable fitting aligns with screw hole in casing guide. Fasten cable with screw (14) and locknut (15) and torque to 60-80 in. lbs. (7-9 Nm). NOTE: Do not overtighten screw. Overtightening may damage nylon casing guide. Secure anchoring of control cables in their respective fittings to prevent loosening and dislodging during operation. 4. Position cable trunnion (E) in recess, compress friction detent spring (F), and reinstall throttle lever. Tighten center screw to 25-35 in. lbs. (2,8-3,9 Nm). 5. Repeat procedure for shift cable. 6. Reassemble control box, torque screws to 60-80 in. lbs. (7-9 Nm), and go to "Install Remote Control in Boat." 1. Remove throttle control lever using "Starboard Installation" procedures. 2. 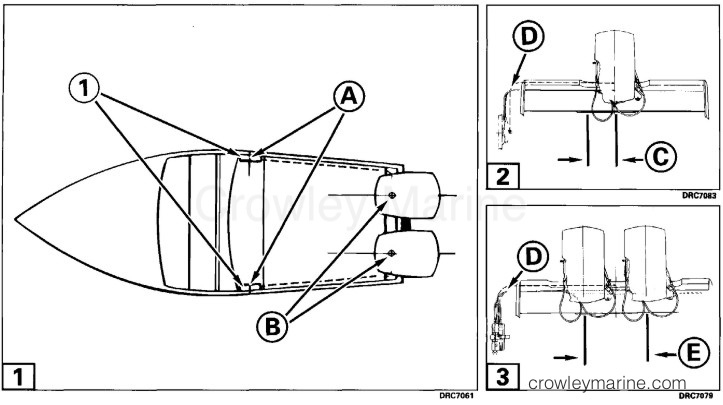 Align casing guide (C), square, with throttle lever (B), and remove insert (G). 3. Reverse casing guide and reinstall. Position rib on insert (H) parallel to casing guide when replacing insert. 4. Remove idle stop mechanism and install in opposite end of box (I). Note position of components before removing. 5. Complete assembly following Steps 3 thru 6 in "Starboard Installation." 6. Repeat procedure for gear shift lever. 1. Hold control box in selected position and mark location of four mounting holes (J) on mounting surface. 2. Drill four pilot holes where marked and attach control box with four screws (11) at (J). 1. Run cable in straight line without sags, or sharp bends. Secure cable to boat 24 in. behind control and each 24 in. along cable with tie straps. 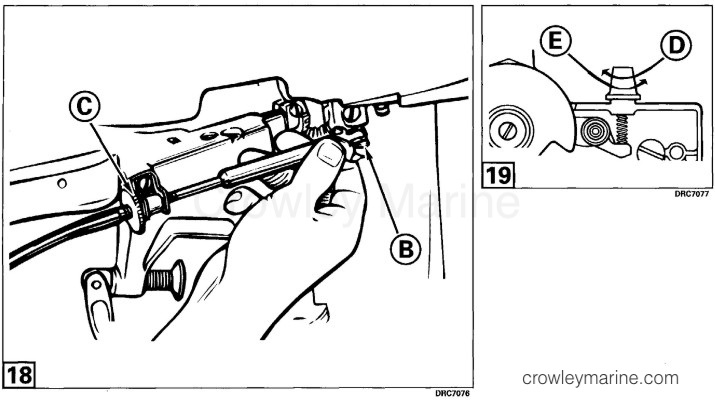 On dual outboards, use control cable straps (12) and strap screws (13). Secure cables with additional straps every 24 in. Attach last strap 5 in. from outboard centerline (A), shown with optional transom plate and cable anchor. Bend radius should be at least 6 in. Sharp bends cause wear and premature failure. Minimum loop diameter of 12 in. must be left in cables between last fastener and connection point on outboard. 2. Check action of control and control cables before attaching to outboard/s. Binding could cause control to jam. 1. Attach shift lock (7) stamped "S" (starboard) to starboard (shift lever) side of outboard using lock screw (3), and lock spring (4). NOTE: Some outboards require an additional bracket (B) to attach "S" bracket to outboard. 2. Place shift lever spring (10) on shift lever lock pin (8) and insert pin through casing guide with knob (C) to starboard. Press groove pin (9) through hole in shift lever lock pin. 3. Insert shift cable vertically in bracket and turn to horizontal position as indicated by arrow. 4. Shift remote control shift lever to REVERSE. Coat brass sleeve (D). 5. Shift remote control and outboard to NEUTRAL. Align lock pin on shift cable with shift lever on outboard. 6. Adjust cable length by turning knurled nut (E) on cable. Insert lock pin into outboard shift lever and turn pin clockwise to lock. Ensure lock pin is in fully locked position to prevent loss of control. 7. For dual outboards, repeat procedure for second control. 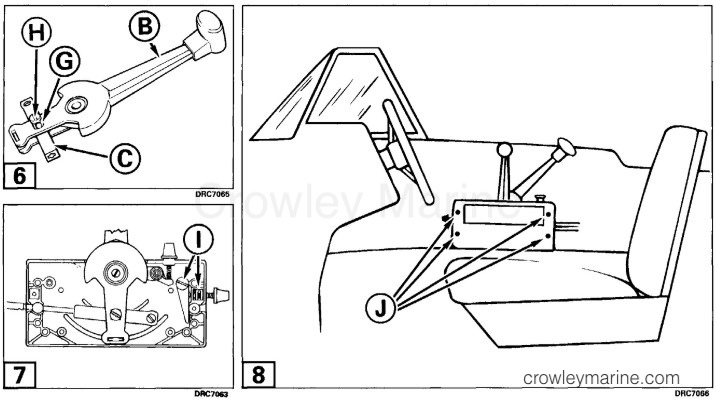 Refer to Service Manual when working on steering handle. 1. If outboard is equipped with steering handle, loosen screw (F) in speed control grip and slide grip off handle, being careful of spring tension. Remove pressure plug (G) and replace spring and speed control grip. 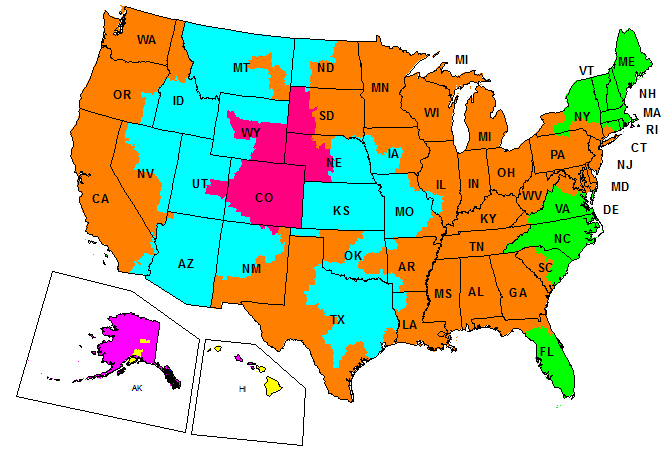 NOTE: Some models recommend removal of steering handle if remote steering is used. 2. Attach throttle lock (5) stamped "P" (port) to port side of outboard on boss provided using lock screw (3) and lock spring (4). 3. Attach spring clip (6) to side of cable guide and rotate clip until holes in clip snap over both pins (A) on guide. 4. Insert throttle control cable vertically into bracket and turn to horizontal position. 5. Place throttle control lever on outboard and on remote control to idle position. Remote control idle adjustment must also be set at slow idle position. 6. Align throttle cable with pin on throttle gear (B) by turning knurled nut (C) on cable. 7. Slip cable end over pin on throttle gear (D), and lock with clip. 8. Place outboard in water and start outboard. Check for smooth operation of shift and throttle. Adjust throttle lever friction by turning adjustment knob (E) clockwise to increase and counterclockwise (F) to decrease friction. 9. With outboard at slow speed in NEUTRAL shift briskly to FORWARD or REVERSE. To shift from FORWARD to REVERSE (or vice versa) reduce throttle to idle, shift to NEUTRAL, pause briefly, then shift briskly to gear.